Kasol, also known as 'little Amsterdam,' is lively with Israeli cafes and small souvenir shops. The hippie culture here is evident, from the groovy clothing to the trance parties that are held here. You'll start your trek to Kheerganga from here, but as you ascend, you'll leave civilization far behind. Kheerganga is the last village in the Parvati Valley, and one of the most beautiful too. It lies high in the hills, and you'll be walking through forests of pine, oak, and conifer. You'll be camping up here, with views of the mountains all around. • Spend a few days in the most gorgeous hills of Kheerganga and Kasol. • Trek through charming villages, small shops and wooden bridges in Kasol. • Experience the hippie fun of Kasol. • Take a dip in the therapuetic hot springs at Kheerganga. • Splash in the cool waters of the Rudranag waterfall. 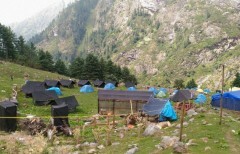 • Camp under starry skies in alpine tents in Kheerganga. Smoking cigarettes, consumption of drugs and alcohol is strictly prohibited during the Kheerganga trek. The instructor's decision is final and participants must adhere to the same on the Kheerganga trek. Littering during the Kheerganga trek is strictly prohibited. For any cancellations made 30 days or more before the departure of the Kheerganga trek: 70% of the total trip cost will be refunded, minus any transaction charges. 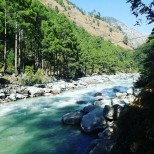 For any cancellations made between 30-15 days before the departure of the Kheerganga trek: 50% of the total trip cost will be refunded, minus any transaction charges. For any cancellations made 0-15 days before the departure of the Kheerganga trek: No refund. You can choose to reschedule the same trip for another batch date, subject to availability. In such a case, 20% of the trek cost will be forfeited. The operator will not be held responsible for any injury, accident or death during the Kheerganga trek and does not provide any insurance for the same. There is a rescue and medical team available at the base for unforeseen emergencies. All participants are required to sign a disclaimer certificate at the base before the departure of the Kheerganga trek. 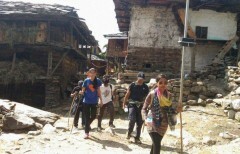 Participants are responsible for the safety of their own belongings during the Kheerganga trek, and the operator shall not be held responsible for any loss or damage. You'll have to report to the campsite in Kasol by 10:00 hrs. You'll have to fill in some paperwork, and then you'll board a bus to take you to Barshaini. You’ll pass quaint villages as well as the Manikaran Gurudwara. In Barshaini, you'll cross an old wooden bridge over the Parvati river beneath you, and start the trek to Kheerganga. It's a 7-hour long trek through the quaint villages of Kalga and Pulga, and you'll stop at the Rudra Nag waterfall before you get to Kheerganga. You can dip your feet in the soothing hot water springs and unwind around a bonfire after dusk. You’ll dig into a sumptuous dinner and set up camp on the meadow. Overnight stay in tents. Wake up early and soak in the views of the magnificent Himalayas. You’ll start your descend to Barshaini after breakfast. It's a good day to keep your camera handy and capture some of the scenic views you'll encounter. Hop on to a local bus that will take you back to Kasol. Once at Kasol, your trip ends here. You'll have to report to the Kasol campsite by 10:00 hrs and will board a bus to Barshaini, where your trek begins. You'll reach the meadows of Kheerganga in the evening and will enjoy a bonfire and a delicious meal before retiring to comfortable tents for the night. You'll be provided with sleeping bags and camping mattresses to keep you warm and there is a common washroom at the campsite. You'll begin your descent to Barshaini after breakfast and will take the local bus to Kasol from the road head. Once you reach Kasol, your trip ends. Kasol is 31 kms from Bhuntar Airport in Kullu. 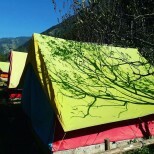 The campsite is located in Sumaropa, on the Kasol-Manikaran highway, near Hotel Anupam. The operator will arrange your transport to the start point of the Kheerganga trek.